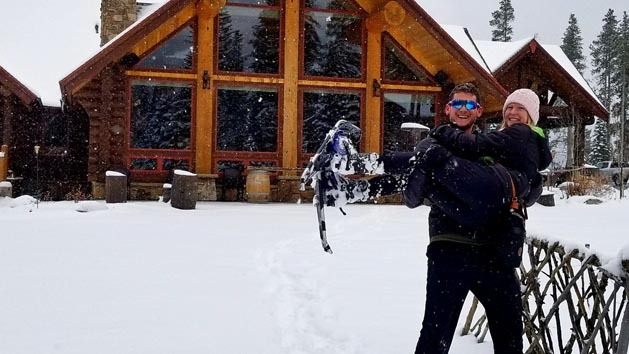 The Breckenridge Nordic Center is a chance to get away from it all and experience the joy of gliding across snow through quiet, beautiful forests with expansive views of the mountains surrounding Breckenridge. It’s a great place to get outdoors and enjoy time with family and friends. Whatever your ability or athletic levels are, you can tailor your time to create what you feel like doing in the moment. Whether it’s cross country skiing, or snowshoeing, you can spend as little as an hour out on the trails or all day by choosing the distance and terrain you’d like to explore. 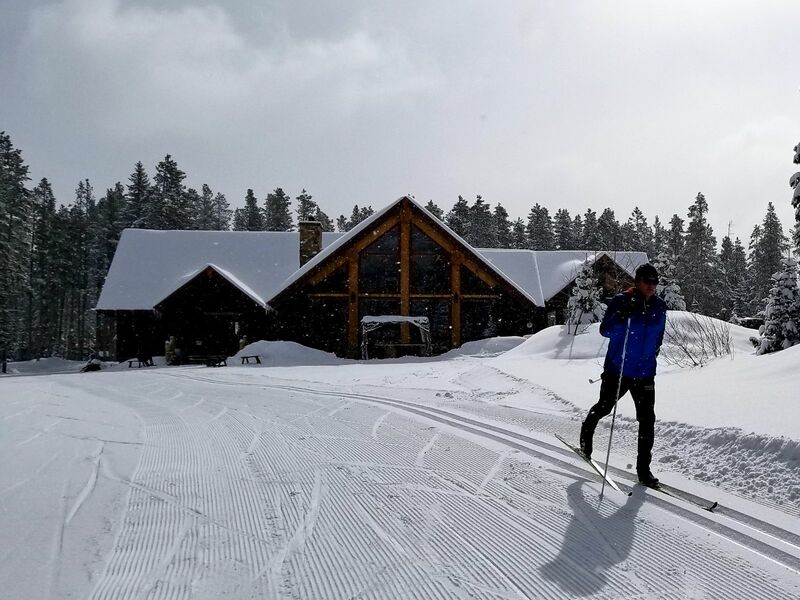 If you’re new to Nordic Cross Country Skiing and feel like you’d like to have a lesson, our professional instructors will get you quickly up to speed. We also have Snowshoe Adventure Tours and Snowcat Adventure Tours available by reservation. Our trail area covers over 1,400 acres of enchanting forest with soaring mountain views, yet you won’t have to drive far to find us. We’re just a minute from Downtown Breckenridge and the Free Ski and Ride Shuttle stops at our front door. When you arrive at the Lodge, you can rent or purchase all your equipment needs. If you already have your gear, just purchase a Day or Season pass and you’re ready to hit the trails. We start children skiing with Step-In Skis when they can walk. Younger ones may be pulled by child “pulk” sleds. The sleds glide well over packed snow and are fully covered, insulated and ventilated. Learn to ski with our experienced, kind and patient staff. 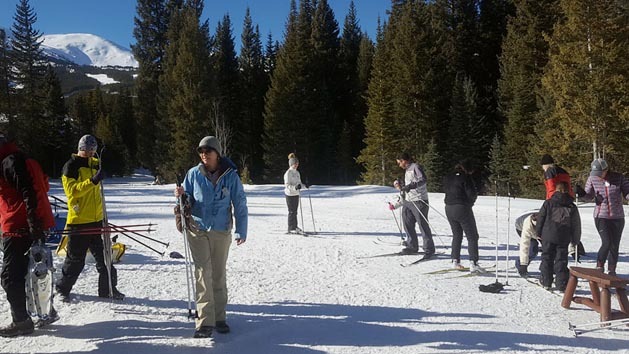 A lesson is truly the best way to start skiing and get the most enjoyment out of cross country skiing. A group lesson is also a great way to meet people on your skill level and find a ski buddy for another day. Children under 12 must be in semi private lessons. Rentals are not included in the lesson fee. Be sure to add 1 nordic ski rental to the cart per person from the related items below. Payments are non-refundable if tour/lesson is cancelled within 24 hours. Credit can be used for up to one year on lesson, tours, rentals, or trail passes. Follow an expert guide over the snow and through the woods to find the best views, learn a bit about snow science, our local ecosystem, and history of the area. Keep your eyes peeled for our unique local wildlife and bring a camera for the views. Groups with children under 12 must sign up in semi private adventure. Rentals are not included in the lesson fee. Be sure to add 1 snowshoe rental to the cart per person. Groups with children under 12 must sign up in semi private adventure.